As a sort of advent calendar of kitsch, Pictorial will be counting down the final twelve days before Christmas by featuring some holiday presents of days gone by. No mom reading Women’s Day in December 1990 was getting away without being forced to confront the fact her daughter simply had to have a Barbie house, or a Barbie car, or at the very least a Happy Holidays Barbie. 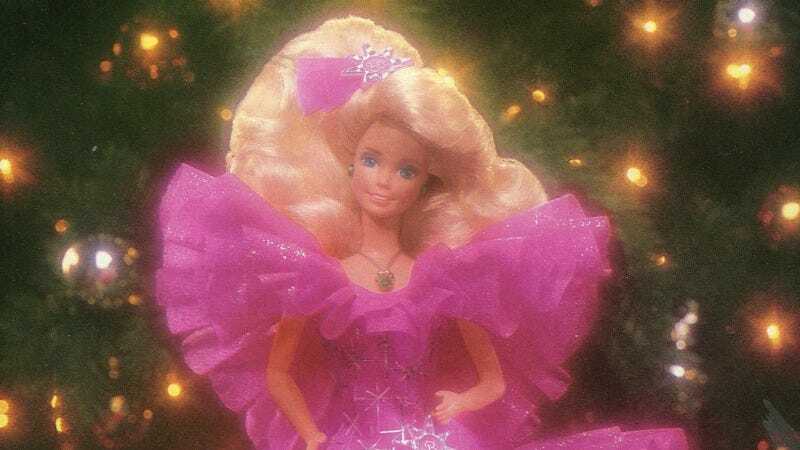 The only thing bigger than her hair is her ruffled sleeves! Such a magnificent plastic creation requires the proper setting. Hence, the Barbie Magical Mansion. “Requires assembly,” a phrase that will haunt this girl’s parents for decades. “Remember the year of the Magical Mansion?” “Oh, Christ, don’t remind me.” But good for Barbie for buying herself the biggest house she could find and hosing the whole thing with Pepto Bismal. You might think such a home would have a hot-pink sports car in the driveway, but it turns out Barbie prefers the classics, specifically this baby-blue ‘57 Chevy. The world of Barbie is as big as a child’s imagination, as long as that imagination did not extend to unteased and/or bobbed hair.